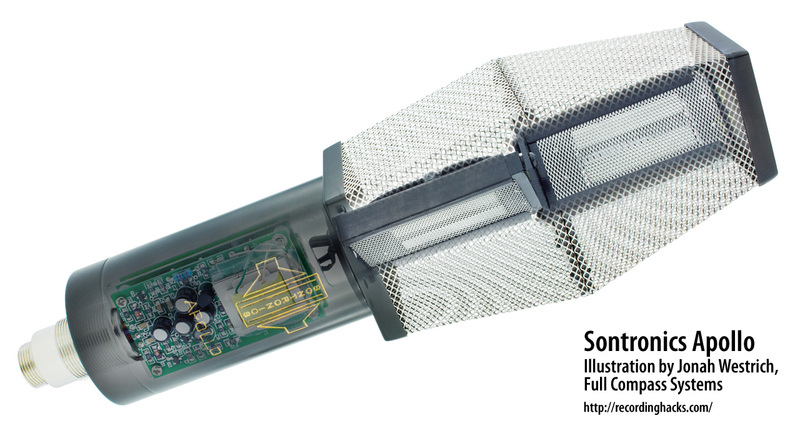 The Sontronics Apollo is an active stereo ribbon mic based on the Sigma, another ribbon microphone from Sontronics. The Apollo’s dual transducers are in a fixed XY configuration, and since both ribbons offer a bi-directional polar response, the Apollo functions as a Blumlein mic. The ribbons are independent of each other, allowing for use of the Apollo as a mono ribbon microphone. One of the primary benefits of stereo microphones is that they eliminate many of the difficulties associated with accurate placement for stereo recordings. The Apollo is no exception, though only for Blumlein setups. Since both ribbons are fixed in their positions, other stereo configurations such as ORTF are not an option. According to one reviewer, the Apollo does not perfectly address another issue inherent to stereo setups: gain matching. For critical Blumlein stereo recordings, both transducers must be evenly matched. We tested two Apollos and in both cases the upper section produced slightly less output than the lower section. This is worth knowing because by pointing two individual microphones directly at the source with the polarity of one side reversed, it is easy to match the volume levels. This is more tricky with the Apollo because the transducers are at a fixed angle. As is typical of ribbon mics, the Apollo exhibits a pronounced yet smooth high-end rolloff. Otherwise the frequency response is less flat than that of the Sigma. The Apollo’s frequency response chart shows a slight bump at 600 Hz and a small dip at 900 Hz. The Apollo design aesthetics fit in well with Sontronics’s other offerings. Though the mic body is a normal cylindrical shape, the ribbons are housed in a striking “open-basket” cage, providing a clear look at the transducers. 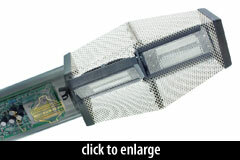 The mic ships in a padded aluminum flightcase and comes with the same unique shockmount that is included with the Delta and Sigma models from Sontronics.